Member of the European Parliament Dr. Wolf Klinz, on his visit to Manila on November 3-5, 2010, expressed confidence that the Liberal Party of the Philippines (LP) has the capacity to push for reforms in the country particularly by using its position as the party in power. In a meeting at the Friedrich Naumann Foundation for Liberty (FNF) in Makati City, Dr. Klinz discussed citizens’ engagement with LP Director-General Atty. Chito Gascon. “LP has an important role in educating the people about the benefits of a system that is based on true democracy, transparency, and accountability,” said Dr. Klinz. Dr. Klinz is with the Freie Demokratische Partei (FDP) that is part of the Alliance of Liberals and Democrats for Europe (ALDE) in the European Parliament. He is the Chair of Special Committee on the Financial, Economic and Social Crisis. “Dr. Klinz is a very experienced parliamentarian. We appreciate his confidence in the capacity of Filipino Liberals to ultimately promote a sustainable governance agenda,” stated Atty. Gascon. “He shares our belief that party building should be prioritized, and that we should vigorously encourage students, youth, and young professionals to participate in our party processes in order to promote a successor generation of leaders that will continue the reforms,” Atty. Gascon added. Dr. Klinz also met with FNF Philippines Country Director Jules Maaten. Mr. Maaten enumerated the projects that FNF Philippines has undertaken to advance the principles of participatory democracy, human rights and the rule of law, and market economy in the country. 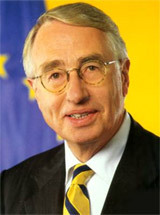 "Dr Klinz's visit to Manila is of importance, as there is a real need for Europe and the Philippines to work more energetically with each other both on trade issues and on political issues such as promoting good governance and fighting corruption,” shared Mr. Maaten who is also a former member of the European Parliament. "It his good that Wolf Klinz made a special effort to engage with Filipino Liberals." Similarly, the Secretariat of the Council of Asian Liberals and Democrats (CALD) briefed Dr. Klinz on the nature of their work. “Dr. Klinz sees CALD as a mechanism to institutionalize and strengthen political parties in a region characterized by patron-client relations and machine politics,” said CALD Executive Director Lito Arlegue. Dr. Klinz was part of the European Parliament Delegation that was in Manila for a three-day visit. The group met with heads of Philippine institutions, among whom was Chairwoman Etta Rosales of the Commission on Human Rights (CHR).